Freeman Forman are delighted to present beautifully presented four bedroom detached family home set in a quiet wooded cul-de-sac off Pennington Road with incredible countryside views. The property offers well presented accommodation throughout, with exceptionally large and bright rooms throughout. The open plan lounge/dining area is double aspect and has beautiful views over woodland and fields, patio doors lead out to the garden from the lounge. Downstairs is also comprised of a kitchen/breakfast room with separate utility area, a cloakroom and integral garage. Stairs rise to the first floor landing, with feature window and enough space for a small reading area and sofa. Four double bedrooms are available, three of which have built in cupboards, the master has a recently renovated en-suite bathroom and offers exceptional countryside views to the rear. A recently renovated family shower room is also offered. The property is situated in a peaceful wooded cul-de-sac off Pennington road in Southborough, set back from the road with a mature front garden. A driveway large enough for two cars, double garage and incredibly private rear garden is offered. The rear garden is mostly laid to lawn, with a large patio area leading out from the lounge. 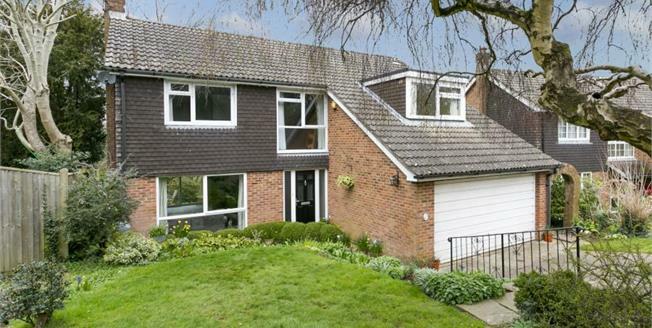 It backs onto woodland and looks out over Honnington Farm fields. Southborough's high street hosts a range of local shops and services, from convenience stores, family bakers and master butchers to wine merchants and a variety of restaurants. A new community theatre has been planned as part of the proposed Southborough Hub, which also features a library and new doctors surgery. There are excellent primary schools and pre-schools in the village, with a choice of excellent grammar schools and other educational options available in nearby Tunbridge Wells and Tonbridge. The High Brooms Mainline Railway Station and the A21 are within easy reach for commuters.